A Wrinkle In Time is a beloved story for many children. It's a jumping off point for young readers to love books about daring girls, impossible worlds, and traveling through space and time. 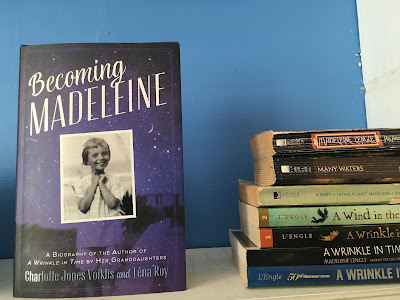 For me, it was a doorway to the writing of Madeleine L'Engle and I happily tore through the remaining books in the Time Quintet, traveled through the streets of New York with Katherine Forrester, and read her reflections on life and love in The Crosswicks Journals. L'Engle passed away in 2007 and her granddaughters Charlotte and Lena wanted to give her readers a glimpse into the life of their beloved grandmother. 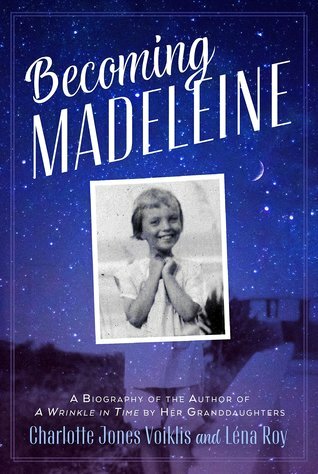 They spent years going through her childhood letters and journals to write Becoming Madeleine. This book is a treasure trove for the L'Engle fan who wants to learn more about their favorite writer. Voiklis and Roy started with their grandmother's earliest memories and wrote about her difficult relationship with her parents and her troubles and triumphs at school. They included photographs, journal entries, and letters from Madeleine. It's fascinating to read words she wrote as a child and young woman and compare them to her voice as an adult writer of fiction and nonfiction. But I wished there was more of a personal touch to this book. Voiklis and Roy stop the book when A Wrinkle in Time is accepted for publication, which means we don't get to witness L'Engle as a grandmother to the authors. I can certainly understand wanting to keep your memories for yourself, but it feels as if anyone could have compiled her early letters to write this book. Becoming Madeleine is intended for young readers, so the writing style is clear and simple. While I would have loved a more personal book, this book is a crucial addition to your bookshelves if you love Madeleine L'Engle and want to know about her younger years. A personal touch is nice in these kinds of books, so I can see why you'd have liked to have a bit more development in that area, however being able to get a glimpse at the life of a creative you enjoy is always lovely... In some ways, it allows you to feel more of a connection. I haven't yet read A Wrinkle in Time, but I have hopes to at some point this year. It was a nice read. It's so interesting to think of specific childhood experiences shaping an adult writer. Let me know when you read Wrinkle. I'd love to hear your thoughts! What a fun idea for a book! I read so many of L'Engle's books when I was a kid, and I've been meaning to revisit them. Maybe I should pick this one up, too! L'Engle is one of the few writers I do re-read. Those books are good for the soul on days when it seems that everything is a mess. I never read a Wrinkle in Time, but I can imagine how great reading a biography on one of my favorite childhood authors would be!